Loman’s own werewolf agent, Walter Ramsey. Born in Scotland in the 1600s, Walter was an ordinary traveling merchant until he came across a pack of werewolves in Jurgenburg, Livionia. After witnessing them transform and do battle with demonic entities from a portal, Walter wanted to and was inducted into their pack, called The Hounds of God. As part of the Hounds, Walter protected Europe from demonic threats during his travels, until the height of supernatural paranoia led to the deaths of several of his pack members and the eldest member being lashed when he attempted to reveal their work to the outside world. Walter realized his family was not safe and went to protect them, but his wife, and their daughter, left Walter to sail to the Colonies. Walter traveled the world in a drunker stupor over the centuries, fighting any random supernatural threat he comes across while slowly losing himself more and more to his werewolf self, until he was approached by Arthur Loman in working with his Loman Organization. Using a nanomachines to regulate his transformations, Walter was given a renewed sense of purpose in doing the work that he originally started with the Hounds of God. Currently, Walter works as a field operative for Team Zeus, along with Adam Mortensen. He acts as a semi-father figure to agent Deidra Edelweiss, and a drinking buddy to several members of the Loman Organization. Abilities: As a werewolf, Walter is capable of transforming into a wolfen creature with enhanced strength, speed and senses. When in his human form, Walter possesses a degree of enhanced strength and all of his enhanced senses. While Walter is capable of transforming at will, his emotional state in both his human and were forms change based on the phases of the moon. Stage 1: Similar to the Wolfman films, with full hair, enlongated claws and fangs and increased muscle mass. Stage 2: An in-between to Wolfman and wolf form. Even more increased strength and power. Stage 4: Full access to his werewolf traits, yet is driven by pure instinct and harder to keep in control. Walter wears flexible body armor that stretches during his transformations and boots that open at the toes when he goes into full werewolf mode. Walter also favors wearing a trenchcoat that is enchanted with protective wards and armor lined to protect Walter form physical and mystical attacks. Creation: Walter was created as me and Carlos both are werewolf fans and wanted to make a werewolf character. I made him more of a fun character and gave him a laid-back personality, while Carlos helped in fleshing out his backstory and added the father figure role to elemental witch Deidra. I based his character of a historical reference in 1692 by a court testimony about an old man in Jurgenburg, Livonia, who claimed that werewolves were agents of God and that he and several other werewolves would travel to Hell and fight demons, while the Hounds of God Tag came from a werewolf character in Neil Gaiman’s, The Graveyard Book. 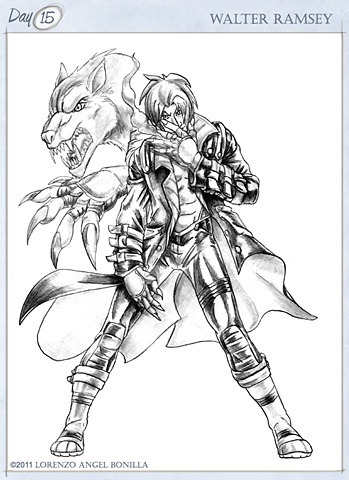 The pose shows his semi-casual look as the pose was referencing a Hellblazer cover,, while his werewolf form is shown behind him as a tell of what his werewolf form would look like to the viewer.